When my younger son turned one about a year and a half ago, I felt the itch to do something more. Being home with two toddler boys had its rewarding moments, but every few months I would struggle with finding my identity outside of motherhood. Should I go back to work? Take up a hobby? Go back to school? My itch was creative– I have always written, but a daily practice and focus on the craft just wasn’t possible after a full day with the kids. I needed something that I could work on just an hour a day and still feel accomplished. When I saw a beautiful new craft store in Montclair, i thought about taking a sewing class there, then just took the leap. I had an idea in my head, that I could make quilts like the ones my aunt JoAnn had made for me and my sister when we were kids. I had loved my quilt, staring at all the different fabrics arranged in staggered rectangles, wondering how they could look so crazy but so beautiful at the same time. It was completely original, and I loved showing it off at college, where kids all seemed to have the same comforters from Bed Bath and Beyond. If I made my own, I could pick the fabrics myself, which appealed to my sense of design. To the practical side of myself, I reasoned, quilts provide warmth and can last a long time. It just made sense to me. I had always looked down on crafting in general as a waste of time and accumulation of clutter. I had never taken naturally to the domestic arts (this is a HUGE understatement– I could possibly be awarded certification in frozen pizza differentiation and have lived with dust bunnies the size of a small dog), but in general when it made sense for my life, I was ready and open. When I had time to cook, I perfected some recipes. When we found a home that we loved, I took more care to keep it clean. By discovering my desire to quilt, suddenly I understood the need to make and the rewards of making something you can hold in your hands. What I didn’t know beforehand was that the online community and the one at the fabric store would be so inspiring, supportive and encouraging. 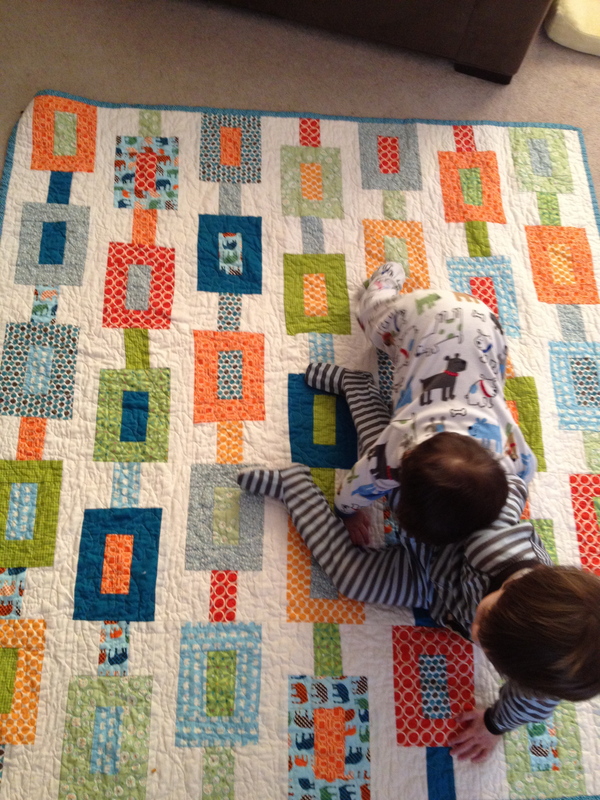 That there is so much information about quilting that I could teach myself something like free motion quilting. And that I would find a group of quilters in real life, through Newbees and the Modern Quilt Guild, who would continue to inspire me with creativity and generosity, qualities that continue to inform parts of my non-quilting life. I have made some great friends. Then, on a more selfish note, there is the rush. Making something that you think is beautiful has its own high, a feeling of accomplishment that I have never found in my creative life. When you write something, unless it is published, you rarely get to look at it and think, “wow, I made this beautiful thing.” Instead, most writers will think that there is something wrong with it and want to edit it into oblivion. Having a quilt that I made with my own hands from the fabric that I picked, I felt such satisfaction and joy. Being able to show it to other people with pride has been a reward that continues to surprise me. Quilting saved me from myself. It brought color to my life and gave me purpose. It taught me to slow down and make plans. To take the extra time to shop local when you can. It even made me a better writer by teaching me about my own creative process. I am so happy to have found it and am proud to call myself a quilter. And a fabulous quilter you are, Mel! Thank you! It means a lot coming from you. Love, love, love this. Such a great post!